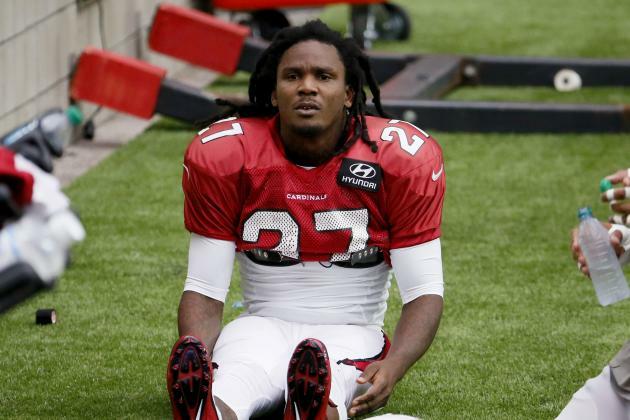 Bad news officially handed down today for the Arizona Cardinals as running back Chris Johnson has been diagnosed with a fractured tibia and will be on the sidelines for 6-8 weeks according to Mike Jurecki of FOX Sports 910 Phoenix. Johnson injured his leg during the third quarter of Sunday’s 19-13 win over the San Fransisco 49ers. Before leaving the game, Johnson had rushed for 17 yards on 12 carries. The loss of Johnson is a big blow to the Cardinals and their lofty Super Bowl aspirations this year. Johnson entered the game 4th in the NFL in rushing with 793 yards, putting him on pace to rush for 1,184 yards this year. This would have marked the first time he has reached the 1,000 yard mark since 2013 when he rushed for 1,077 yards while a member of the Tennessee Titans. Signing with Arizona for the veteran minimum this year after a rough season with the New York Jets, Johnson had been the work horse for the Cardinals, averaging 4.1 yards per carry, a huge step up from Arizona’s 3.29 ypc from 2014 (last in the NFL). Johnson’s backup, Andre Ellington, was also injured on Sunday, leaving the game in the third quarter with turf toe. He is considered day-to-day, but his status for this weekend’s game against the St. Louis Rams is up in the air. Rookie third round draft pick David Johnson is expected to take over the reins of the running game if Ellington is to miss any time. David Johnson has rushed for 139 yards on 35 carries in 2015 since being drafted out of Northern Iowa.